Rather than adding one, can we just extend one of Tokarski, Hackett, or Boyle? From what I can gather there is no NHL games played requirement for goaltenders, they just have to be under contract for next season. So yes we can just extend one of those goaltenders and have them available for the expansion draft. I wonder what the future is for Bernier. If he keeps up the stats he has so far this season he might fancy his chances of getting another starting gig somewhere. Kinda drab. I feel like I could have played the Golden Knights in badminton circa Grade 7... Definitely one of those smarmy Catholic schools from the east end. So they're in the Pacific Division and their home jersey is either teal like the Sharks or black like the Ducks and Kings. Well done. The jokes I've seen about Vegas include their logo looking like Magneto's helmet. That's actually on point. And the name being an AYSO team. I didn't realize Vermette is exposed. Anaheim Ducks centre Antoine Vermette and Boston Bruins goaltender Tuukka Rask each hold no-move clauses that run until June 15, 2017 – just two days before each team must submit a list of protected players. That makes them eligible to be exposed (although, in Rask’s case, it’s virtually guaranteed not to happen). Arizona Coyotes goalie Mike Smith saw his no move expire last June and falls into the same category. Yeah I believe his NMC kicks in again right after the expansion draft. I'm gonna call them the Ace Hoplites. Also, the color scheme could've been brighter and more vibrant for a city like Vegas, I mean it's not Canadian tundra. But I guess it's a question of taste. Ace 'Lites sounds like a cheap malt liquor found in skeezy liquor stores everywhere. Not just Vegas. Works for me. (4/4) but once the draft is done, regardless if the player is selected or not, that the NMC survive & continue to be part of his contract. I think Bieksa should be a team player and waive his NMC to protect Silfverberg. I was just poking around Capfriendly's expansion draft tool and there are a LOT of teams that are going to have a hard time qualifying enough forwards for exposure in the expansion draft. You have to have 2 forwards who are under contract through 2017-18 and who have played in at least 40 games this season or 70 games between this season and last. There are quite a few teams that won't be able to meet that requirement with their current rosters unless they start exposing top-6 forwards. Surely those teams will be looking to make trades in order to protect their best players. I like your devious mind. You like his devious understanding, but it is Bob who is the devil. His moves appear to have a deep purpose most of the time. It's so nice that we have people like DTS to decipher them. Vegas Golden Knights will officially be in the hockey business this afternoon. I's dotted...T's crossed...George McPhee can start dealing. I sure hope that this is what Bob spent his time working on today. Alright gang, what do you think? Sounds about right, although no deals involving a player can be officially made until the season is over. So we won't know if the Ducks do anything until June. I have a question on the expansion draft. Vegas gets to pick 1 player from each of the 30 other teams. Then they get to pick players in the entry draft. A team is allowed to dress 23 players. I'm sure VGF will have an AHL affiliate. Will that be up for next season because I've heard nothing on that. If not, what happens to the 7+ players that aren't on the dressing roster? So, the league finally assented. Wonder what the timeframe is prior to the draft itself? Just saw this as well. Glad they're making it public. 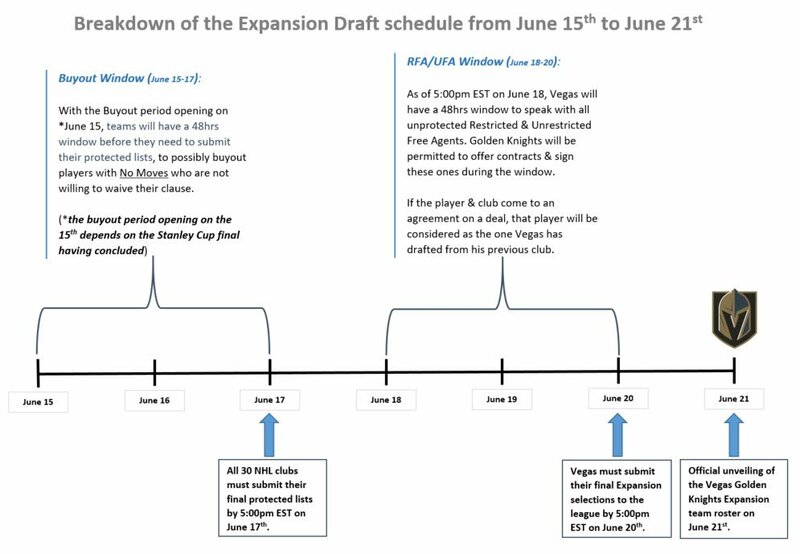 BREAKING: Protected and available player lists for the Vegas expansion draft WILL be made public and released likely on June 18, per NHL. A high level look at what will be a very busy week leading up to the unveiling of #Vegas Golden Knights expansion team on June 21, 2017. Leave him in the east where he belongs. There's enough pinball, non-sensical D men in the west already. Barf. Apparently Phaneuf refused to waive his NMC. Lololol. Okey dokey, I am absolutely bloody tired of hearing the Ducks will expose Silf. Not going to happen, full stop. Really going to surrender someone with his development curve? He'll unprotect Vats before Silf. Other than that, some good thoughts in here. Roster like this would give LA, AZ some fits and keep them in the bottom half of the division. Reason for this trade? It's so the Caps can protect Lars Eller in the expansion draft. Gives them another forward under contract thru 17-18.